Texas Chili: This was very good. I didn't have low carb corn tortillas so I left them out. Substituted Tuscan Blend for the Oregano. Otherwise followed the recipe. When the chili was done, I put it on "keep warm" high and let the sauce cook down to thicken a bit. Served over cauliflower rice. Creamy Shrimp Scampi: the zucchini noodles fell to mush in this, even though I added them uncooked (the recipe calls for cooked). I think they could be added after the pressure release and stirred in for a few minutes to heat through, or very thick uncooked noodles should be used. Keeping up with the ketogenic diet to lose weight can be challenging, but cooking for it doesn’t have to be. 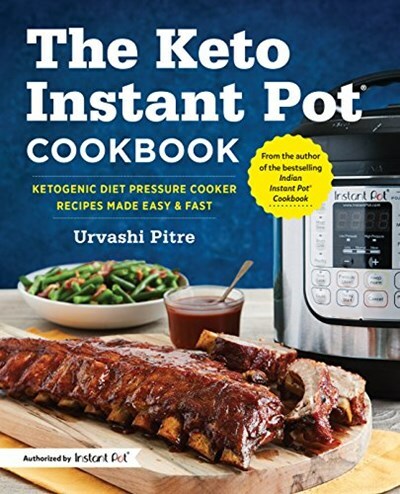 On a mission to make keto convenient, Urvashi Pitre - the bestselling author behind Two Sleevers and The Indian Instant Pot® Cookbook - combines delicious low-carb recipes with the home cook’s favorite appliance: the Instant Pot®. The Keto Instant Pot® Cookbook is the only authorized ketogenic diet Instant Pot® cookbook for tried and true recipes ridiculously easy and fast.